Clink on link below and then press the play option. I know, it looks like an ad page, but its not…. 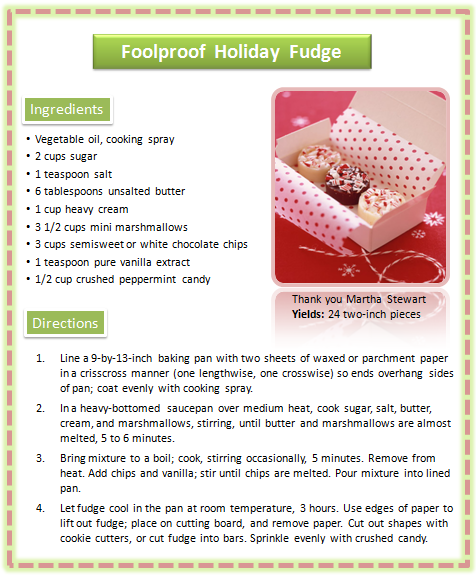 I’m going to make this fudge for all those who I need to say thank you….. and for those who surprise me and show up with goodies in-hand. I’m going to out due Martha Stewart and come up with inexpensive packaging and smaller bites. It’ll spread the cheer further. I love Christmas, don’t you! Its the best time of the year. Even years like this one, where the money is so tight that I’m making all my gifts and walking around the block to see the lights. (we usually drive around and say “ooo” a lot) With the joy that only Christmas can bring, I wish you a Merry Christmas.